I’ve written a lot about housekeeping routines, laundry routines, etc. here on the blog. As my family has grown, I have tried numerous things to keep my laundry mountain under control. Admittedly, I have struggled with keeping up with a laundry routine since I first got married and there was only two of us! It’s no wonder I’ve tried so many things! The first laundry routine I tried was a once a week method. I would gather all of our laundry up and wash and dry it all, and then attempt to fold and put it all away. It DID NOT work. That much laundry would literally take me all day to deal with. I just don’t have time for that. The next routine I tried was a sort of divided approach. I got each family member a basket and as I folded the clothes I placed them in each person’s basket to be put away. Once again, it just did not work. I ended up putting the kids’ laundry away anyway. I searched Pinterest high and low to find a solution that would work. Too bad I can’t get an automatic folding and clothes putting away machine! There was nothing I could commit to and I always ended up with piles of dirty and clean laundry that I felt like I just could not deal with! You know what I’ve discovered? I was overthinking the laundry routine way too much, and I was worrying about it way too much. 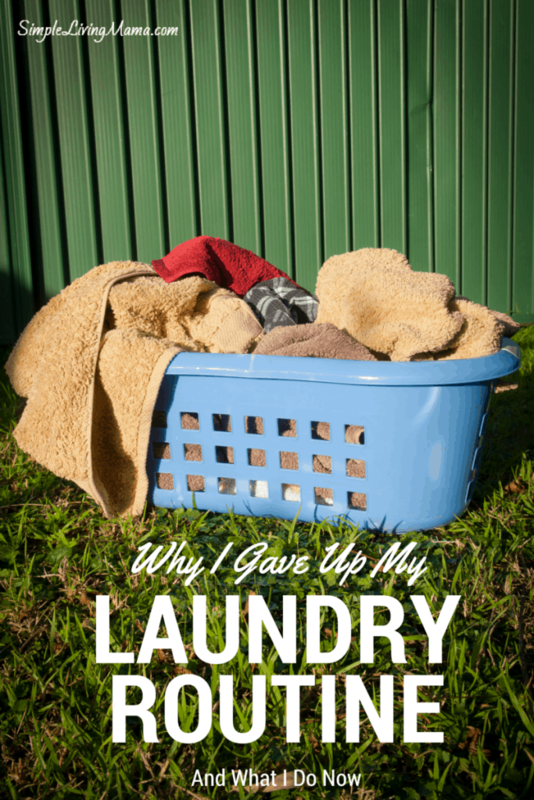 I was so afraid of not sticking to the routine that every time I slacked I let it overwhelm me to the point that the laundry would just get behind and I would have to take a whole day to dig out of it. Every morning I start a load of laundry. When it’s done, I throw it in the dryer and start another load. When that load is done, I take out the dry load and load the dryer again. Sometime in the afternoon I get around to folding and putting away the laundry. Guess what? My laundry pile is smaller than it ever has been because I’m not overthinking some magic routine. I’m just doing what needs to be done. I currently have four kids, so is all the laundry ever done? Nope. Are there days I don’t do any laundry? Yep. The pressure is now off. I just get off my behind and get done what I can get done. Do you have a laundry routine? I’d love to hear how you handle this mundane chore! Leave me a comment! Laundry can get overwhelming. My 10 year old daughter helps wash and dry each day. We usually wash 2-3 loads a day and the folding happens during chore time before breakfast each day. Sometimes when the mountain of clean clothes gets too large or we’ve washed extra, I’ll stop and fold for 10-20 minutes to help get it back under control. Even my preschoolers can help “fold” small items or their own clothes. I teach them to try to fold everything into a square. Great idea to have the littles help! I’m trying to teach mine to fold everything into a square, too! I like the KISS approach you present here. Keeping it simple and not overthinking something as common as laundry should not only speed up the process but alleviate much unneeded stress. Thanks for the inspiration! I do it exactly like you do it except for one detail. I put the folded kids’ laundry on their chairs at the dinner table. Visitors don’t see it, since it is tucked under the table, but the kids have to put it away before dinner! Sounds like a great idea, Kristy! We are only a family of four so this routine may not work for you but I thought I would share since it gets the job done and I never stress over laundry. I work full time and don’t get home until about 7pm. I do one load per evening. Each person has their own basket and everything in their basket pretty much gets washed together on cold. I have never had a problem with colors running this way. Of course if an item is new and looks like it may transfer, I wash it separately with darks first. But most of our clothes are hand me downs so I don’t have to do this often. The kids put their clothes away themselves. On the fifth weeknight I wash towels. I use the weekends to do sheets and catch up on anything else! Thanks, Erin! I tried the basket routine, but I think most of my children are still too young to put away their clothes. I do think I may try this again, though! Great idea! I have four kids and we live with many people at our household. My mother-in-law helps me a lot with doing the laundry and doing all the cleaning chores, but I many times I feel overwhelmed with doing the laundry and cleaning. It is nice to overthink my routine and to try another method that seems more efficient. I think that the method that you’ve found is great and I am sure going to try it! Thanks for sharing! Thanks, Krista. I hate overthinking things that should be so simple! Laundry is definitely one of my least favorite chores. It’s the chore that never ends! That is kind of what I do. The main difference is that I also assign one child to each day to help. We work together to sort, wash, change over and fold. Now if I can only figure out the socks! Very similar to what I do. I try to do all the laundry every-other-day. I save my husband’s work clothes for once a week. I do towels once theres enough. Probably twice a week. It’s refreshing to see someone else that has a “non-routine” and it works. Just get it done, don’t overthink! Love it. Thanks. I have three separate laundry areas, a four section hamper in my room, a three section in the kids bathroom, and a laundry pail in the mud room (laundry room) on the main floor. I wash colors on Monday, Lights on Tuesday, Workout Clothes (and things that can’t be put in the dryer) on Wednesday, Thursday is towels and napkins, Friday, Saturday, Sunday anything else that may need to be washed or if someone wet the bed or something and my days get off or if I don’t get to it on the regular day everything moves down a day. I have a family of five. This works for us.